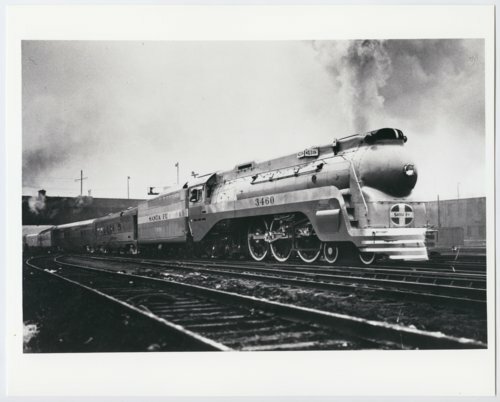 This black and white photograph shows the Atchison, Topeka & Santa Fe Railway Company's steam locomotive #3460 the "Blue Goose" pulling the passenger train the "Super Chief" at an unidentified location. The "Hudson" type locomotive built in 1937 by the Baldwin Locomotive Works of Philadelphia, Pennsylvania had a 4-6-4 wheel arrangement. It was scrapped for metal in 1956.